This’ll be a short post, due to this week being fun but not terribly unusual :). I’m continuing to work on my research projects in lab, interspersed with attending fantastic lab meetings and lectures. By this point, I feel like I’m starting to get a sense of what kind of research goes on in MIT’s Brain and Cognitive Science labs—I recognize the people, have a vague idea of what they’re working on, and have an idea of how labs approach problems and what problems they consider to be important. It’s a very different kind of learning—the second of what I consider to be the two main forms of learning. In the first type of learning, you don’t know anything, and so a lot of information is being thrown at you and you’re trying to sort out how it all fits together—find its internal structure—as well as absorbing it. In the second, you have background knowledge; you have the framework; but you’re learning the details, reconfirming the details you already know, and slotting everything into place. Come to think of it, this is analogous to the major divide in machine learning: unsupervised learning (learning structure from data without ground-truth labels) versus supervised learning (having previous knowledge and being asked to classify new information). I’m in the latter stage of learning with regards to my work in lab and lectures. In my classes, I’ve been in the latter stage for the past year or so as well. The one exception was my machine learning class last semester, when all of the concepts as well as the details were new to me. That was a singular experience, bringing me back to my earlier years of college—I forget how much you learn when everything is novel. I’m interested to see what I build on, compared to what I start from scratch, when I go to graduate school. For example, I’ve spent the past three years focused on vision—it would feel kind of insane to focus on language and linguistics for a time, but that’s something I’d very much like to try. Of course, once you’re in your third year of your PhD, everything has narrowed down to an infinitesimally small grain of focus—I love this description of it—so then I’ll be in the latter stage of learning a lot of the time. But I digress. These are thoughts that have been flitting around my head since I’ve been thinking about where to apply to PhD programs :). For my ridiculous story of the week, I had an intensely proud moment when I went to a bar, had an entire alcoholic beverage, and enjoyed myself. Three ludicrous things in combination, but there you have it. David, Amaya, and I headed over to the Muddy Charles, MIT’s pub on campus, and joined the many others who were there to eat free chicken wings and discuss fast Fourier transforms (I kid you not). I struggled mightily with the carbonation of my cider (6% alcohol, man! Praise me, praise me), but had a great time chatting for three hours with those two. I feel like such a college student slash adult—or, more aptly, like a graduate student, since they constitute that nice cross and were also the majority of the people there. My other non-research exciting thing this week was getting to watch very athletic dancing—in the form of Cirque du Soleil on Wednesday night, and Urbanity (a Boston-based contemporary dance group) today. As a philistine with a baffling dislike of low-brow entertainment (I have decided I’m middle-brow), Cirque du Soleil is about the highest form of art that one could ever achieve in my regard. The tickets were subsidized by Sidney-Pacific, the graduate apartment building I’m staying in this summer, and I had a lovely time sitting up high and watching the aerials for $24. I’m fighting the urge to go again—there’s not much art that can compete with how much I love Cirque. 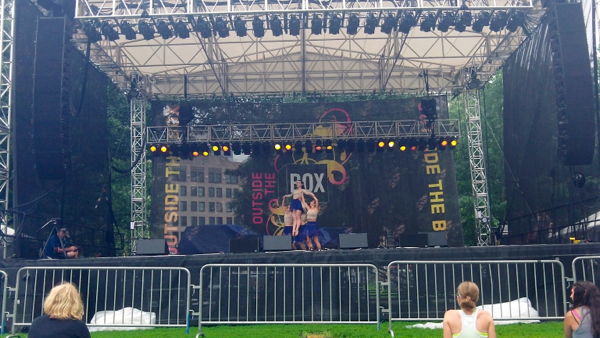 Today, I finally made it to Boston’s Outside the Box festival, where Patricia and I collected all sorts of free food before settling down to watch two dance shows. I had a great time watching Urbanity—they aren’t hip-hop, which is my favorite type of dancing, but they were very good, and had many beautiful movements. I would like to talk to some professional dancers sometime, to figure out what a typical career path looks like for them. I know the career path to medical school and to graduate school, but I get so wrapped up in academia that I have no understanding of how you’d train for a conservatory, or if that is the typical path. Sayat Nova, according to the Outside the Box Boston 2015 schedule! http://otbboston.com/site/ All I know is that they had bagpipe music backing up their dancing, which was much appreciated. 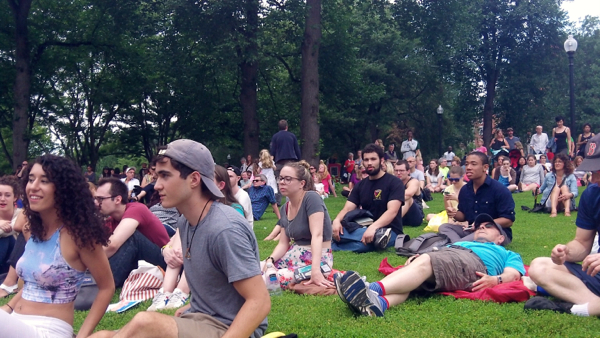 This is the Park Street stage, where Urbanity was performing. Pretty nice turn-out, too! 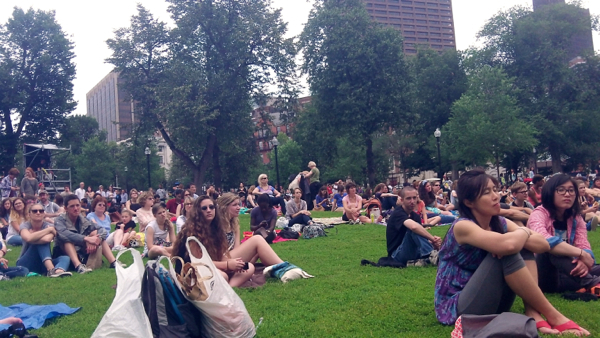 Here are the people sitting besides me, on the Downtown-Boston side. And that’s really all for the week, readers! I wish you all the best, and questions and comments are appreciated if you have them :).